I consider this my best image. Last edited by BenGodson on Mon Nov 12, 2018 6:36 pm, edited 2 times in total. Last edited by bystander on Wed Nov 14, 2018 5:25 am, edited 1 time in total. Reason: Please, no hotlinks to images > 500Kb. Substituted smaller images. While starting to image NGC2392 (Eskimo Nebula), I noticed a faint blur to its southeast. Turned out to be comet 38P/Stphan-Oterma. Later, upon reviewing the GIF I had created, I found several asteroids in the vicinity, most notably Asteroid (45234) 1999 XA228. 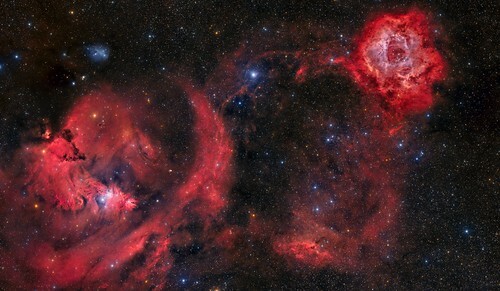 It turned out to be a lively image and another example of how really dynamic our universe is. That's a great image! The comet really moves in it! That's a great image and a fantastic composition. The pinnacles do indeed create a "throne" shape, with the pinnacles as armrests. Behind them, green sky steamers seems to fall from the outer edges of the picture down into the seat of the throne. 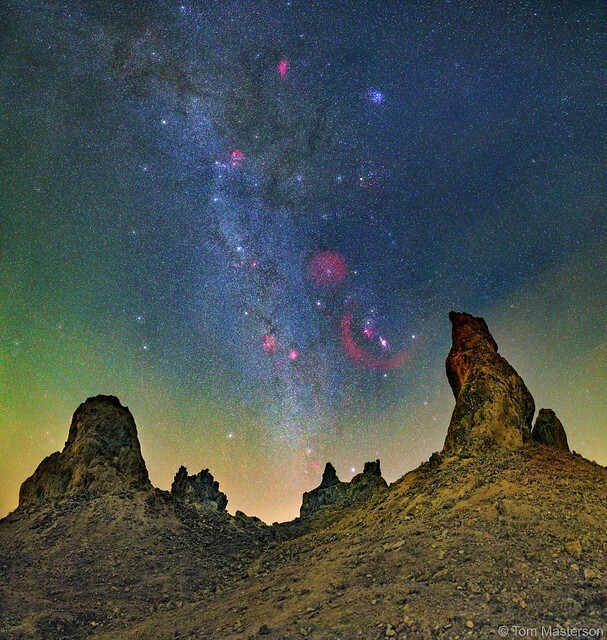 And above it all, the glorious winter Milky Way seems to fall into (or rise out of) the same throne, sparklingly pink and blue. Three different objects in this image demonstrate the immensity of the known universe. The bright star is 16 Piscium, located just 100 light-years from Earth, within our home Milky Way galaxy. The pair of interacting galaxies (Arp 284) are a thousand times further away than the bright star, 100 million light-years from Earth. Finally, the tiny blue quasar's (B2333+019A) & (B2334+019A) are a hundred times further away than the pair of galaxies at 10 and 11 billion light-years from Earth. The 3 different objects demonstrate the immense power of gravity. 1. 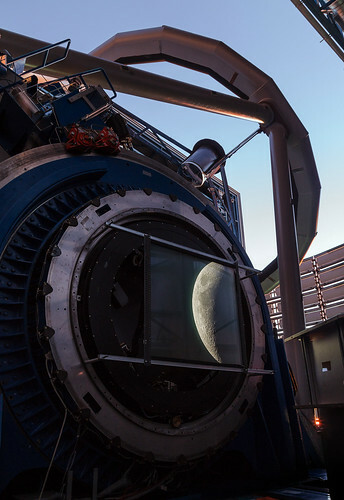 The bright star creates light through gravity-generated fusion. 2. 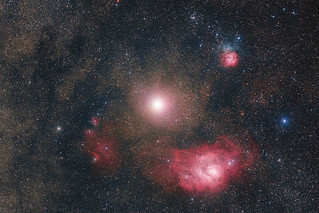 Gravity is pulling the pair of galaxies Arp 284 also known as (NGC 7714 and NGC 7715) toward each other, gradually tearing them apart in the process. 3. Finally, 2 separate super massive black holes have so much gravitational pull that it is vacuuming up its host galaxy, allowing only an extremely bright jet of light (the 2 quasars) to escape and be blasted towards Earth. We are seeing light that started its journey when the universe was relatively young at just 3 billion years old. As a color commentator, I had to "color diagnose" the bright star and the galaxies and apply my amateur diagnosis on the color of the quasars. The star, 16 Psc, is an F6V type of star, and it is a bit bluer than the Sun. If it were to replace the Sun in the Solar system, it would pretty much instantly kill us because it is four times brighter and a lot more ultraviolet than the Sun. But just before we passed out, we might be able to notice that, yes, it does appear to be about this shade of blue-white to our G-type Sun-adapted eyes. So the color of the star is fine! 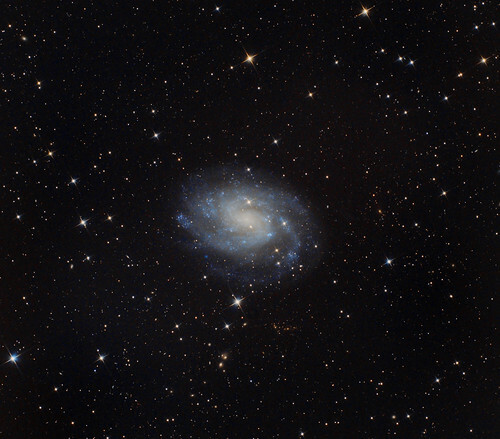 As for the galaxies, NGC 7714 and NGC 7715, my software Guide, quoting Principal Galaxy Catalog, claims that the B-V color of NGC 7714, the face-on galaxy, is as blue as 0.520. That is really quite blue for a galaxy, and I don't think that the galaxy looks as blue as that in your picture. 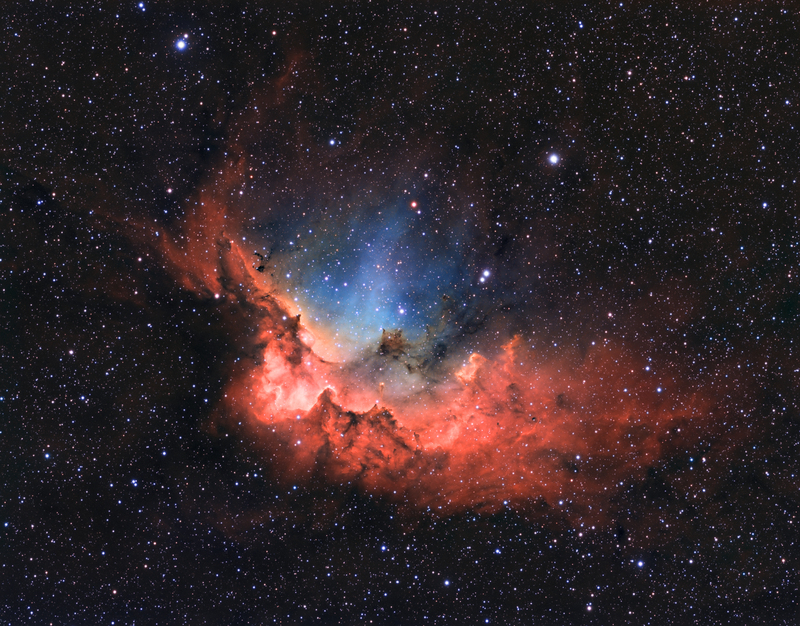 NGC 7714 has a bright and reddish inner disk and a non-starforming bright outer arc-shaped arm of an intermediate color. 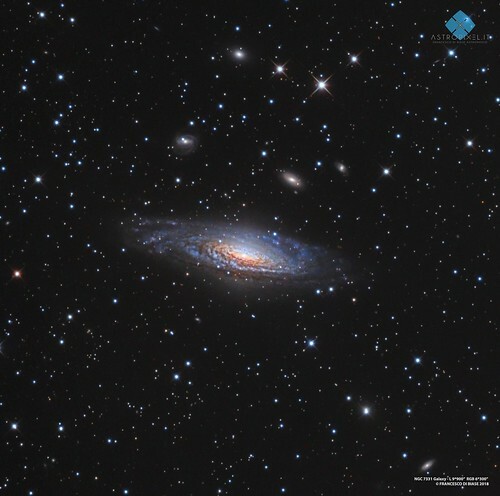 To produce an overall "galaxy light" that is as blue as 0.520, even though the galaxy contains such a large number of old yellow stars, those brilliant blue stars of NGC 7714 had better be very blue indeed. 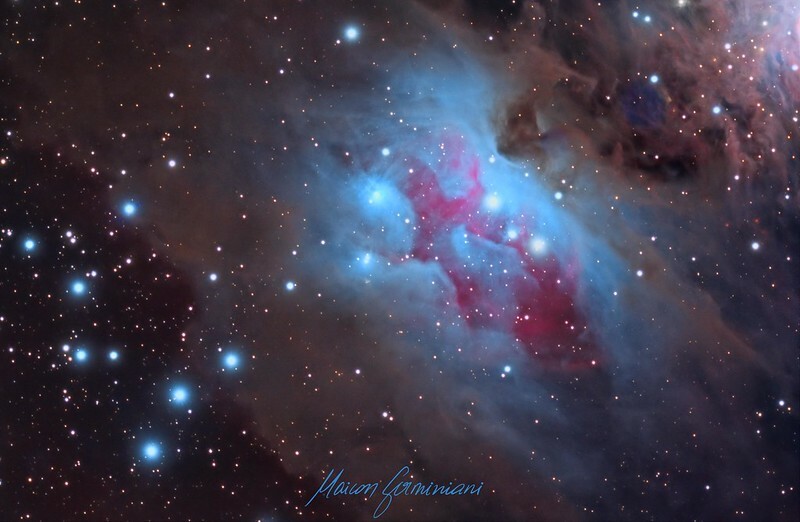 Perhaps there are a lot of brilliant blue stars hidden in the glaring light of the nucleus? Well, The Principal Galaxy Catalog got one thing right. 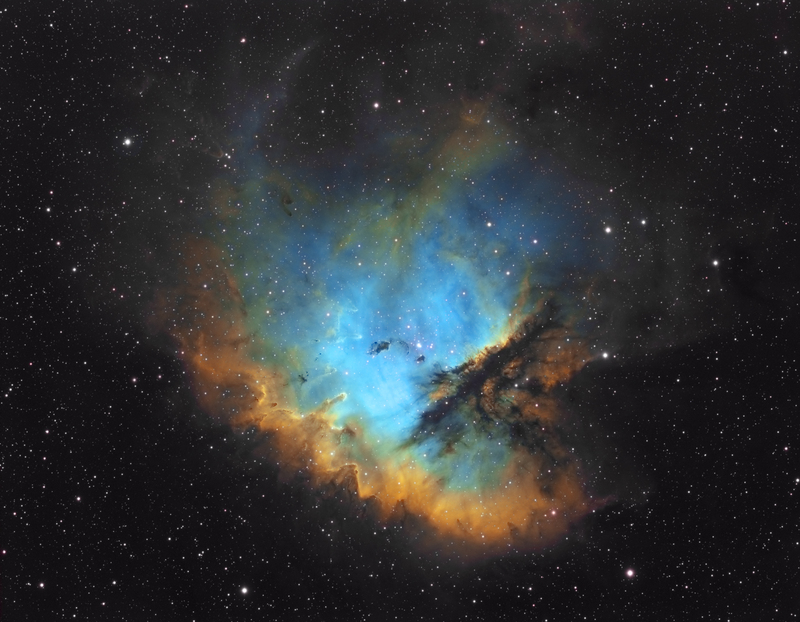 NGC 7714 is really quite blue, but it is tremendously ultraviolet! That is exactly what you would expect from a galaxy with a tremendous burst of star formation superposed on a relatively large and bright old yellow population. 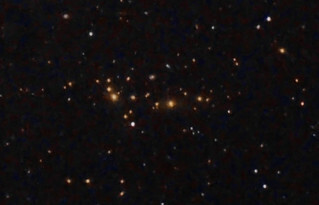 NGC 7715, the edge-on galaxy, has a bluer B-V index than NGC 7714. To me NGC 7715 in your picture appears to lack an old yellow population altogether! Finally, the quasars. Their blue color is due to highly redshifted extremely energetic far ultraviolet light produced by the accretion disks of the supermassive black holes. I once saw a sequence of pictures showing what apparent color you would expect from quasars at different redshifts, and if I remember correctly, quasars at a distance of 10 and 11 billion light-years would still display a bluish B-V index if we measured their light from the Earth. What a fantastic picture! Thank you! 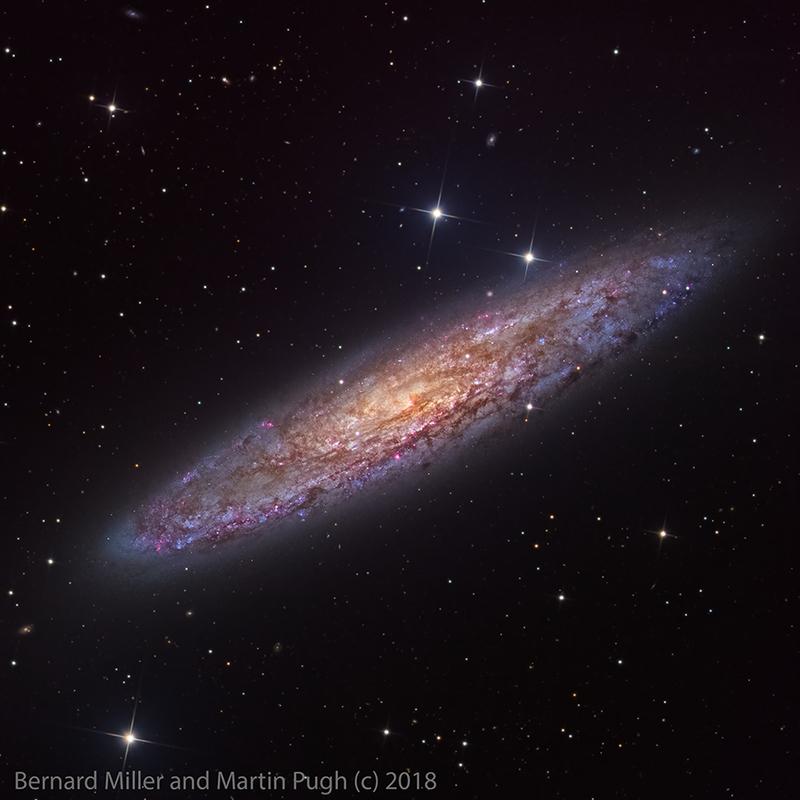 This is an image of NGC253, also known as the Sculptor Galaxy. It is a spiral galaxy about 11 million light years away in the constellation Sculptor. It is a starburst galaxy which means it is undergoing a period of intense star formation. 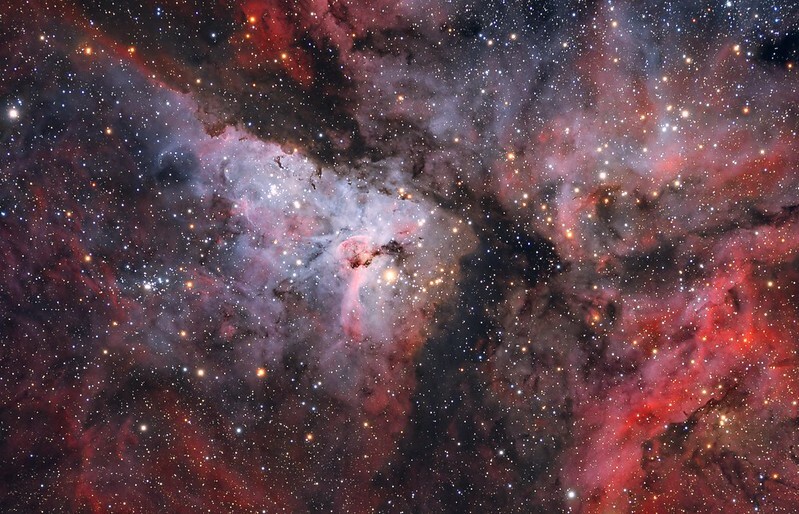 The image data was captured by Martin Pugh and processed by me (Bernard Miller). This is a shot taken under on average good sky from the Apulian countryside in south Italy, with my personal traveller setup. Setup: RC12" f/8 2430mm - CCD KAI4022 - Active Optic Sx - iOptron CEM120 mount. All 9*900" Luminance frames was taken in binning 1x1 and 0.63"/pixel resolution, RGB (6*500" each channel) was taken in binning 2x2. Data captured and processed by me. 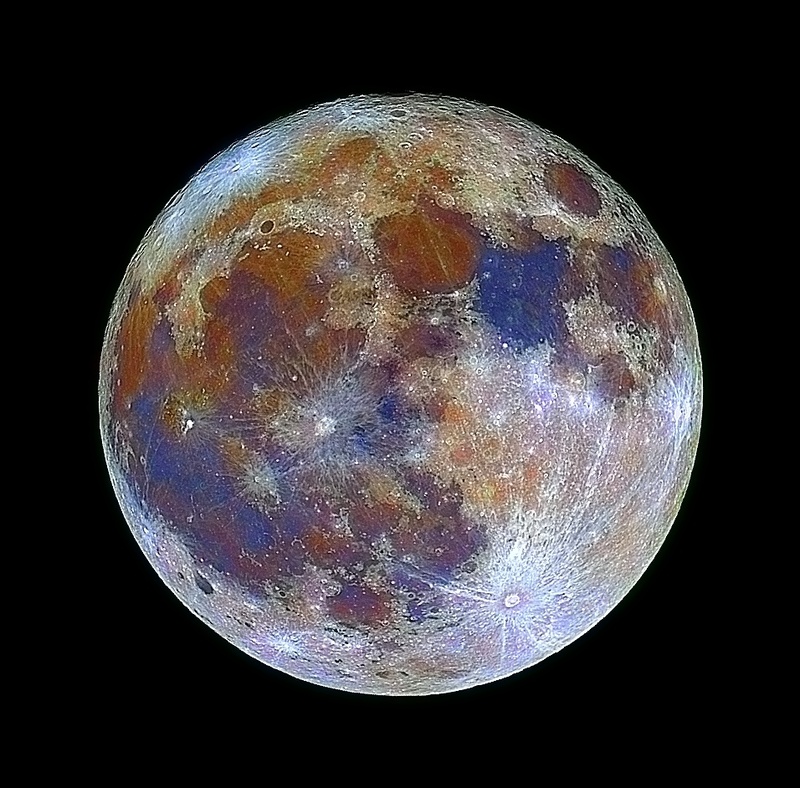 This is my very first colourful image of the Moon. Each colour represent different mineralogy: silicates, titanium, iron, and other. It is an RGB image obtained with a simple DSLR camera, combined with the luminance of a monochrome mosaic image from a DMK camera. I would like to thank M. Alain Paillou for his help to discover the secrets of lunar colour image processing techniques. In memory of that master geologist who taught me that the Moon is much more interesting than I ever imagined. Taken from Melbourne, Australia on 16 November 2018. Composite image, Canon 6D, Sigma 180m lens, 1/100s F/8 ISO-100 for Moon and 1s f/4 ISO-1600 for Mars, merged and cropped in Photoshop. Closest separation was 1.1° during daylight hours approximately 7 hours earlier. 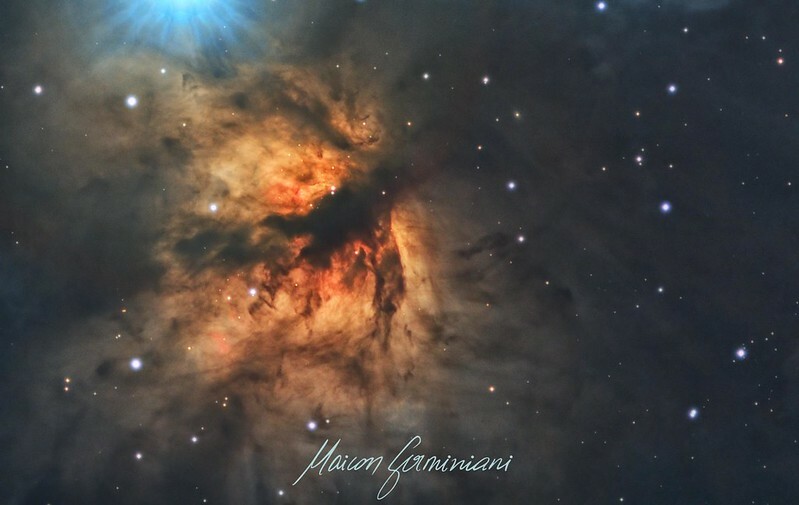 M 78 - captured in my observatory near Kiev, Ukraine by 350 mm Newton. 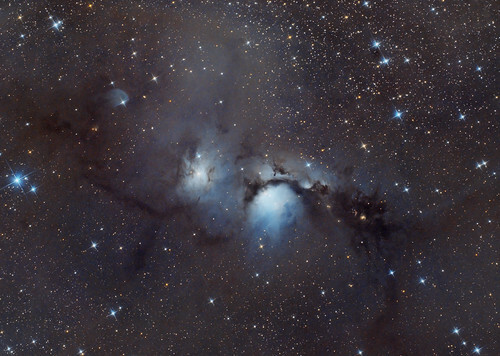 You have shown that there are traces of red Hα in M78, as well as dark dust and a lot of reflected bluish starlight. I really, really like this picture! I particularly like how the Rosette Nebula and the nebulosity surrounding the Christmas Tree cluster seem to be connected. Bluish star 13 Monoceros (top center) seems to sit like a spider in its web, casting threads in both directions to connect the two prominent nebulas. Last edited by bystander on Mon Nov 19, 2018 5:47 pm, edited 2 times in total.